There is one (and only one) strand of scientific theory that gives astro trading credibility (astro traders typically operate without reference to science or logical reasoning, and more on faith, which doesn’t sit well with me), namely that planetary alignment influences solar activity (which in turn influences the financial markets through sunspots and geomagnetism), so is there any evidence for this? 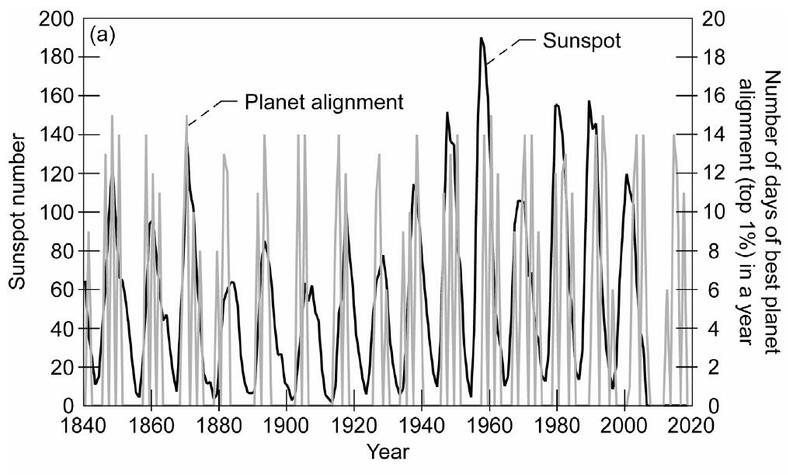 Essentially, the most aligned days between these 3 planets correlate very well with solar cycles, suggesting these tidal planets are the key driver of the sun’s known 11-year cycle of activity. NOTE: only these three tidal planets are found to be infuential, not other planets. So astro traders drawing on Mars or Saturn, for instance, do not have this scientific backing. Now here are just a couple of my own multiple charts which provide evidence of the correlation between solar activity and the financial markets. Astro traders who forecast the financial markets by considering constellations of Jupiter, Venus and Earth potentially are one step back in the process compared to my own assessment of sunspots and geomagnetism, HOWEVER this depends on their method (whether or not they are considering most aligned days between these three planets, or other configurations or drawing in other planets). Do we need to go this one step further back? Well, we can predict the sunspot cycle fairly reliably without having to calculate planetary alignment (NASA forecast this) and we know the next peak should occur around Feb/March 2013. We can also predict geomagnetism using a space weather forecast up to 3 weeks out, and we can model it further out using historic seasonal geomagnetism. It is therefore questionnable what additional predictiveness planetary calculations can offer. In summary, there is evidence to link together the alignment of Jupiter, Venus and the Earth with the sun’s activity cycle and the financial markets. There is a lack of evidence for other planets being influential. If predicting using sunspots and geomagnetism forecasts is one stage back, then predicting using most aligned days of those three planets is one stage further back, however it is questionnable what additional benefit this offers. Here is the up/down pressure model for this year. Last year was “N” shaped. This year I see step shaped. My original target was 1425 for the 8th March 2012. I thought it was demanding when I set it back on 23rd Nov 2011 and it still looks high but that’s the figure and with a push of up pressure from tomorrow onwards who knows. When I say “step” I mean – “a drive – a bellcurve- a drive”. The level reached on the 8th March is most likely to be the point of control of the bellcurve. The up and down pressure is denoted along the bottom as before. Thanks for sharing Preston. Mar-Apr and Sep-Oct are the months of highest seasonal geomagnetism, so from a different angle I get something not dissimilar. What is up/down pressure? Is it related to the Bradley Model? It calls for this year;s top for Mar 16. These are very interesting charts and analysis. The alignment of these three planets might be of questionnable additional benefit when taken on its own, but it still adds a lot of weight to the other analyses on your site. It strikes me that the alignment peaks correlate very well with geomagnetism peaks (as detailed in the last table on your “Timetables” page). Then, looking at the long-term DJIA chart (on your Ultra Long Term Models page) we can see that buying stocks at geomagnetism peaks during secular bears would be an extremely successful strategy – 1942, 1974 and 1982. You’ve mentioned before that it is difficult to determine the date of the next geomagnetism peak in advance (all we know for sure is that it will follow the solar peak), but the alignment peaks shown in the charts above give us some extra useful information. They appear to anticipate geomagnetism peaking during 2015, which would sit reasonably well with your other analyses. Interesting observation Mark. It doesn’t work for all the peaks but it seems to for the majority. A geomagnetism peak in 2015 would be about right, as you say. Thanks for sharing – seems like a pretty solid theory to me. One question I have is that what impact do you think the next solar cycle will have as it is such a small one in terms of sunspot numbers? I think the last one which was so small goes back to the the time of the Wall Street Crash. Do you think that a ‘crash’ of some kind for equities could be on the cards after the next solar cycle peaks in 2013? An interesting question John. 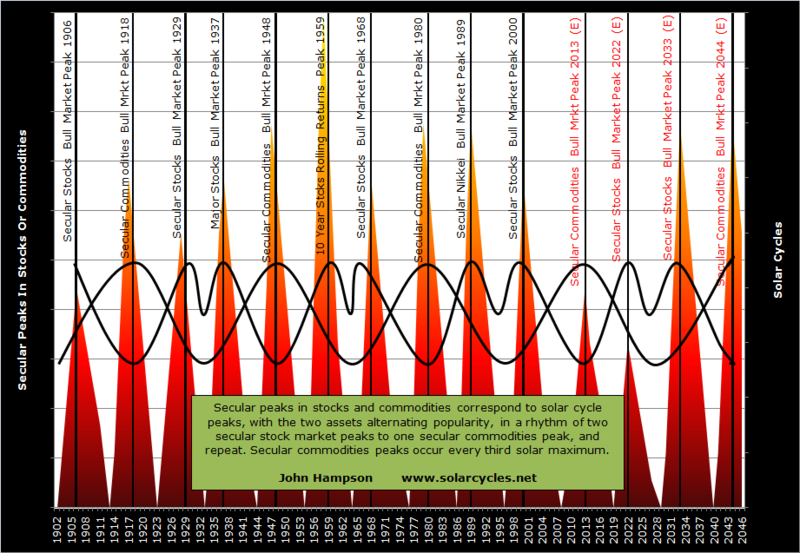 The biggest solar cycle of recent times in terms of sunspots peaked in 1958 yet the associated rup in stocks from the minimum to the peak wasn’t similarly large. The largest run up in stocks was into the 1928 peak and yet this was one of the smaller solar cycles. So no obvious ‘strength’ relationship. For a crash scenario I would envisage a higher geomagnetism peak, and as it happens geomagnetism has been increasing over the last century. So it’s possible we could see a relatively low sunspot peak and a relatively high geomagnetism peak following, and therefore not unreasonable to suggest a crash scenario, but that would again require a ‘strength’ relationship, and I don’t see compelling evidence of crashes having been getting bigger in line with geomagnetism peaks getting bigger as the last 100 years have progressed. thank you John. great information. 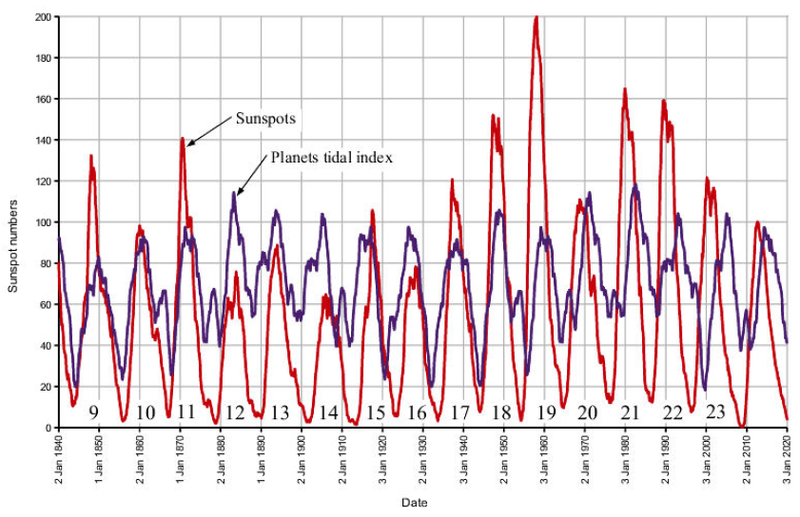 question, in your sunspot chart, 2000 is the only year where the planets tidal index and the sunspots are opposite one another (sunspot high and planets tidal index low). Is seems that sunspots is the longer term cycle (down to 2009) and planets tidal index is a subcycle of that (low 2000, high 2005, low 2009). They lined back up in sync with one another in 2009. I’m confused about how to interpret the swings of the planets tidal index and may be not seeing the forest for the trees – hope you could illuminate for me? tia. (and scroll down) takes you to a comment made by “Anonymous” who has constructed a composite cycle of Jup-Sat-Uran (click on his highlighted ‘composite cycle’) that shows an April 2013 peak and late October 2015 low. An interesting chart. Seems to call the tops and bottoms very well, less well the action in between. Fits well with my forecast. There is evidence that Mars influences the markets. You just have to know how to do it. Read mjmateer’s link above in full. Hi Platypusfoot, is that your site? I’m open minded about what moves the markets but my criteria are a statistical correlation and a scientific or logical explanation, and I’m not finding it in those links. I’d really like to read a paper that demonstrates how and why those other planets move the markets, showing it in charts and stats – do you know of one? Thanks for your interest John. It is my site. The only source I have for the basis of this work is Brad Cowan’s book, “Pentagonal Time Cycle Theory”. I started the blog in order to prove for myself whether the theory had any merit. By now I have become overwhelmingly convinced. Cowan’s book is filled with historical examples; my blog tracks predictions based on the theory. This is the scientific method at work. For the larger planets it would take decades to build a track record of successful predictions. Unique to my site is the application of the method to different instruments, such as silver and natural gas. It works beautifully. John, I insist (not more), the solar pick in 2013 might be similar to 1980 pick, in the end of the year for markets. Before, down, 30-35% Industrials. Hi Antonio. I don’t see that drop in stocks leading into 1980. If you go to this link and scroll down to the SP500 chart, it shows the overlay of the current to the 1970s – I don’t see a major drop. If it’s not based on that, what do you base you 30% drop on? the cycle is similar to 1906-23 and 1966-83 in the Industrials. 1st top in 1966-68, 2nd 73. 2 drops, 30-50%70 and dec74, next top 76 and -0,618 apróx. 1978-80. And -35% because I consider more decline than 1978, because the precedent drop was -54% and Bovespa leads the same movement that DOW in time, you can see Bovespa Chart from 2008-2011. Regards from St. Sebastian, north Spain. I concur with your criteria for the statistical correlation. However, the scientific or logical explanation might have to wait, no? Doctors prescribed aspirin (and we took aspirin) for at least 100 years before we had any logical or scientific explanation as to what made it work. Even today, I believe we don’t know the full story there. Homeopathy continues to be used (and successfully on infants and animals, neither of which have the capacity to produce a placebo effect) but the scientific and logical explanation for how it works still eludes us. For me, the proof is in the data. If we can’t explain it today, maybe tomorrow, maybe next year, maybe next century. Meanwhile, I will still take aspirin for that occasional headache.